Knight Runner: Do you own your dream? I happen to attend a leadership seminar a month ago called Maximum Impact Simulcast held at Rockwell Cinema in July 31, 2009. It was composed of distinguished speakers such as John Maxwell, Tony Blair, Al Weiss, Jack Nicklaus and among others. Everyone had a good sharing about leadership and one topic that was interesting was from John Maxwell where he asked the question "Do you own your dream?" The first response that comes to mind would be "YES", who else will own your dream but you. However, having a dream is something that is also binded by reality. Sometimes the gap between expectation and reality results to disappointment. In order to achieve your dream, you should be able to depend on factors that are within your control. 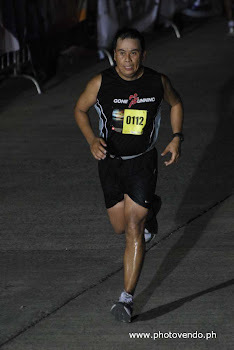 Say you want to join your first 10k, a marathon, or a triathlon, the basic thing that you will do is to follow religiously your training plan and will do anything to stick to that plan because you know that it is instrumental in realizing it. If you dream of being promoted at work, will you be intimidated by people that are aspiring the same position as you do? or will you create an opportunity for you to come closer in attaining your goal? Nothing should stop you from achieving your dream especially when you have control over the things that will help you make it happen. You have to believe it and you have to own it. Sometimes it all goes back to our attitude, if we believe in ourselves and our capabilities, we should be able to challenge all hindrances that will come our way. If we dream, we should not wait for it to be handed over to us, we have to work on it and own it, because the journey towards achieving it would be very challenging and it is never free. As what John Maxwell said, "the more valid reasons to achieve your dream, the more odds there is in achieving it." So, own your dream and make it happen, it is in your hands. Nice post Mark... one more thing that can make a difference.. passion !!! You're right bro! Passion indeed will fuel our drive to meet our dreams.. Thanks!